Residents of a village in Caerphilly county are concerned for their health and house prices after plans for a waste recycling plant were approved. The site at Nine Mile Point, Cwmfelinfach, was initially refused an environmental permit by Natural Resources Wales (NRW). But NRW dropped its opposition in light of new information, and a planning inspector has now approved the scheme. Hazrem Environmental, the firm behind the venture, has been asked to comment. Residents fear emissions will become trapped in the valley. 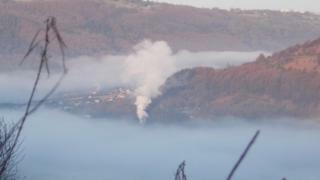 They say the area experiences a rare weather phenomenon known as temperature inversion, which holds cloud over the village for days, and they are calling for a meeting with the Welsh Government. Wendy Jenkins, from Cwmfelinfach, said she was "very, very disappointed". She said she was still concerned about emissions being trapped in the valley and the effect it may have on her asthma, adding: "Some days I've got a job to breathe." Hazrem appealed against the decision by NRW to refuse an environmental permit. A planning inspector has now allowed the appeal and granted a permit. His report said the initial decision by the environment body was based upon "worst-case scenario emissions figures because data that satisfied NRW that emissions would be lower was not available". It added: "NRW is satisfied that the new data shows much lower emissions. It now considers that an environmental permit should be granted, in the form provided in its submissions to the inquiry." Residents have fought for more than two years to try to block the development. Labour councillor Philippa Marsden, who represents Ynysddu ward, said people were also worried about the effect the decision may have on property prices. She said: "I've had several residents refer to the fact their house prices may reduce because of this, because it's not a pleasant operation I suppose, in terms of recycling fuel. "But there's also the increase in traffic, and will this be an area [where] people want to live because of this?" The plant would turn thousands of tonnes of waste that would normally go to landfill into fuel. Hazrem has always maintained air quality limits would not be breached by the plant. In his conclusion, planning inspector, Alwyn Nixon said: "The proposed facility is able to operate satisfactorily in this location without significant harm to the health of the surrounding population." Local politicians are now calling for a meeting with the Welsh Government's new Environment Minister Hannah Blythyn.